Recipe by Gary Rhodes and taken from Sunday Magazine many years ago! Step One : In a large pan, cover the lamb with cold water and bring to the boil. Drain off the water and refresh the meat in cold water. Drain well. Whichever, cut of lamb you use – for example, neck, scrag end or chops – you should always do this blanching process. It removes any impurities and gives the stock a cleaner, clearer finish. Step Two : Slice the onions and then peel and dice the potatoes into 1 in (2.5cm) pieces. Melt the butter in a large saucepan and add the onions, half the potatos and the garlic clove. Step Three : Add the bouquet garni to the pan and fry for 2 mins. Add the lamb cutlets and cover with the chicken stock or water. Bring the liquid to the simmer, cover with a lid and cook for 30 mins. The meat will be half-cooked and the potatoes will have started to puree and thicken the stock. Step Four : Peel and dice the carrots and add them to the pan. Continue to cook the stew for a further 10 mins. Dice the celery sticks into 1 in (2.5cm) pieces and add to the pan with the remaining potatoes. Cook for 15-20 mins. At this stage, the potatoes shouldn’t be cooked until they’re pureed but until they’re just soft. Step Five : Shred the cabbage, add to the pan and cook for another 2-3 minutes until the meat and vegetables are tender. Adding the cabbage towards the end of the cooking time ensures that you don’t lose the fresh flavour and that the stew won’t discolour. Season with salt and freshly ground white pepper. Step Six : Remove the bouquet garni and garnish with the chopped parsley. Serve the stew in individual bowls or from one larg bowl in the middle of the table. You now have a complete meal but even so, I usually serve it with good crusty bread. Step One : Cut four 12 in (30cm) squares of foil. Trim and discard any fat from meat and place a lamb chop in the centre of each foil square. Step Two : Divide the vegetables equally between the lamb chops. Step Three : Preheat the oven to Gas 4/350oC/180oF. In a small bowl, mix together the garlic salt, thyme and the black pepper, then sprinkle over the vegetables. Place lemon slices on top. Step Four : Fold the foil squares tightly around the chops to seal, the place the foil parcels on a large baking sheet. Cook in the preheated oven for 50 mins, or until the chops are tender and cooked through. Discard lemon before serving the lamb and vegetables. Heat the oven to 150oC (gas mark 2). Rub the lamb with a little olive oil. Combine the cardamom, cinnamon, crushed chillies, salt and pepper and rub over the meat. Place in a roasting tin and add enough boiling stock or water to come to a depth of 5mm (¼ in), then add the garlic and whole long chilli. Cover with foil and cook for about 4 hours. Check every 30 minutes to make sure the stock hasn’t evaporated, adding more water if needed. Increase the oven temperature to 180oC (gas mark 4). Return the tin to the oven, uncovered, for a further 30 minutes. Remove and allow the lamb to rest for about 20 minutes. While the lamb is resting, if you wish to make a sauce to accompany the lamb, reduce the cooking liquid by a third by boiling it. Shred the warm meat and arrange on a platter. 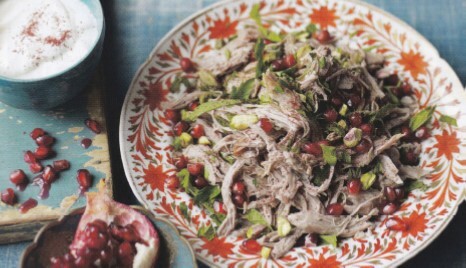 Stir through the chopped mint and top with pomegranate seeds. Sprinkle with a little sumac and the pistachios and season to taste. This recipe courtesy of Easy Living Magazine. 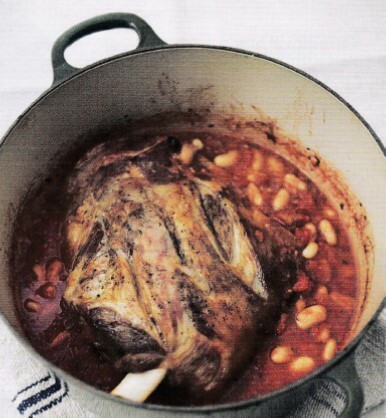 Ingredients: 1 shoulder lamb (with bone); Olive oil; Boiling chicken or beef stock, or water; 3 cloves garlic, unpeeled; 3 sprigs thyme; 1 x 400g (13oz) tin chopped Italian tomatoes; 1 x 400g (13oz) tin cannellini or borlotti beans, drained. Heat the oven to 150oC (gas mark 2). Rub the lamb with a little olive oil and season well with salt and black pepper. Place the lamb in a roasting tin and add enough boiling stock or water to reach a depth of 5mm (¼ in), then add the garlic and thyme. Cover with foil and cook for about 3 ½ hours. Check every 30 minutes to make sure the stock hasn’t evaporated, adding more water if needed. Increase the oven temperature to 170oC (gas mark 3). Add the tomatoes and drained beans to the roasting dish and return to the oven, uncovered, for 30 minutes. Let the lamb rest in the juice for about 20 minutes. Remove the garlic and thyme. Skim off any fat and season to taste. Serve the juice with the lamb. The deep, complex flavours of this vibrant, colourful curry make for a satisfying autumn supper. Neck of lamb is ideal for this dish; it is one of the cheaper and more flavourful cuts of meat and the lengthy cooking tenderises it, so the end result will be meltingly soft. Step One: Heat the oil in a large, heavy-based saucepan over a medium-high heat. Season the lamb with salt and sear for 5 minutes to brown. Remove and set aside. Step Two: Add the ghee to the pan, together with the onions, ginger, garlic, cinnamon, turmeric, garam masala, chilli and 1 tsp of the cardamom pods. Cook for 5 minutes until fragrant, stirring, so the spices don’t burn. Step Three: Stir in the tomatoes, raisins and yogurt, then return he lamb to the pan and reduce the heat to low. Cook for 1 ¼ hours, until the lamb is tender, stirring occasionally. Step Four: When the lamb is almost ready, cook the rice in salted boiling water with the remaining cardamom pods until tender. Drain. Put half the rice into a bowl and stir through the saffron and it’s soaking liquid. Keep warm. Step Five: Spoon half the plain rice onto a platter, then half the saffron rice. 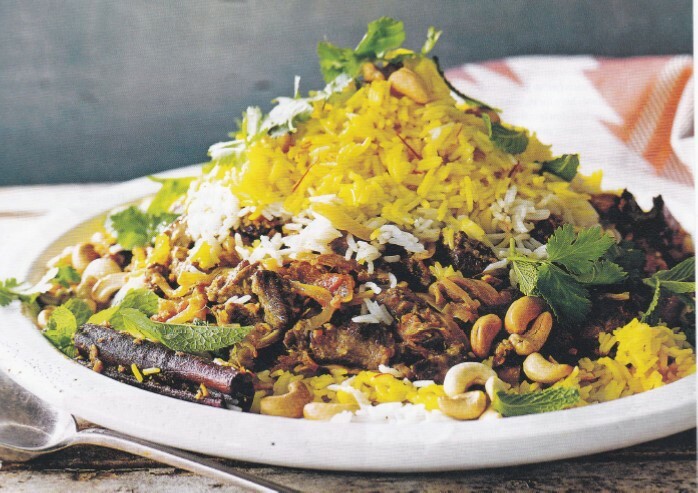 Spoon the lamb over the top, followed by the remaining plain rice and then the remaining saffron rice. Serve with roasted cashews, mint leaves and coriander sprigs. 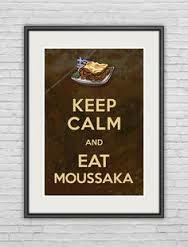 Currently in Corfu and had this for lunch so thought I would add a recipe. Place the aubergine on a plate and sprinkle with salt. Leave to stand for 30 mins. Rinse well and pat dry. Preheat the oven to Gas 4, 350oF, 180oC. Heat the butter and oil in a large pan and fry the aubergine, turning frequently, for 3-4 mins or until golden on both sides. Remove from the pan, drain and reserve. Add onions and garlic to pan, fry for 4 mins, then add lamb and continue to cook for 5 mins. Add tomato puree, stock and thyme, then season well and transfer to a baking dish. To make the sauce: Melt butter in a pan, add flour and cook for 1 min. Remove from heat and stir in milk and cheese. Return to heat, season, and bring to boil, stirring frequently, Remove from heat and beat in egg. Layer aubergines over lamb mixture, then pour sauce on top and cook in oven for 45 mins, or until cooked through. Serve with mixed salad. Ingredients: 1 fillet of lamb, weight approx. 1 – 1 1/2 lb; a bunch of rosemary sprigs and six garlic cloves, cut into large slivers; 1 large glass of red wine and 4 tbsp of olive oil. 1. To make the marmalade, heat the butter and stir in the onions one by one. Cover and cook on a low heat for as long as you can (up to 1 hour) Remove the lid, boil fast, season, add the remaining ingredients and boil fast again, until the wine has disappeared. 2. Meanwhile, make small incisions all over the meat with a sharp knife and insert a small sprig of rosemary and a sliver of garlic in each slit. Place in a dish, pour over the wine and marinate for as long as you can (up to 1 hour). Remove the meat, wipe dry with kitchen paper and brush with olive oil. Season. 3. Cook the lamb over hot barbecue coals (or under a hot grill) for about 10 minutes on each side, covered and over a drip pan, if possible. Turn from time to time and baste with marinade – the lamb should be brown and charred, but still pink inside, according to taste. 4. Slice thinly and serve with the marmalade and chargrilled green beans.